One of the frustrations that many novice birders run into is the tendency to mis-identify a lot of the birds they see, especially those birds which belong to the more difficult groups, such as the sparrows and flycatchers. This is not surprising since there can be, depending on your location and the time of year, a lot of different birds flittering about, all of them commanding your attention but none of them remaining still for very long. In addition, almost every species has more than one plumage coloration during the year: breeding plumage, post-breeding molt and winter plumage. Throw in the juveniles and you get a single bird (as is the case with gulls and eagles) that can have several plumage variations before it becomes an adult. All of these factors combine to make bird identification a real challenge for the beginner birdwatcher. And therein lies one of the real joys of birdwatching; being able to determine not only what species you are looking at, but where that bird is in its life cycle. This article will point out some of the steps you can take to avoid bird identification mistakes. Just bear in mind when you do make mistakes, that any of the expert birders you admire for their vast knowledge about birds didn’t become experts until they too had made their first one thousand identification mistakes. Look at each bird carefully, using the same approach for each bird. For example, start at the head, looking at the size and shape of the bill, and any colour patterns on the sides and top of the head. Then look at its breast, noting any streaks or spots. Look carefully at the wing as many species have a coloured stripe running across its folded wing. Then check out its feet, noting their length and color. Finally, look at the tail, especially its length compared to its body size, any coloured feathers and any color underneath the tail. By checking out the entire bird you can assemble a number of identification traits, which is very useful for birds which have similar-looking species, eg., White-breasted and Red-breasted Nuthatches. By following the same scanning procedure for each bird, you will quickly develop your ability to pick out what is a good distinguishing trait for each bird. Since there may be a number useful identification traits on a single bird, it’s good to have a notebook handy to jot down what you see. Your notes don’t have to be in beautiful, flowing prose and any diagrams you make don’t have to meet the standards of a Rembrandt, as long as it helps you remember the bird while you determine its identification. You may have taken a close look at the bird already, but a second (and even third) good look will often reveal more useful identification traits. And a second look will help fix the image of the bird more firmly in your mind. 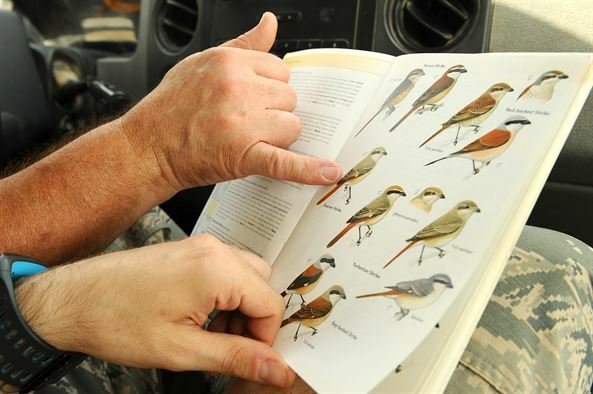 When you’ve got a good image of the bird and are ready to open your field guide, avoid picking the first likely bird you see in the field guide. It will take some time to go through the guide to find all of the possible options but it’s important to ensure you have considerd all the potential birds. How do you know when you’ve considered enough possibilities? Ask yourself the question, “Why did I decide on this species and not that other one?”. If you can’t provide an adequate answer, then you need to spend a bit more time to nail down a positive identification. A tendency of many novice birders is to rely soley on the pictures in the field guide to confirm an identification. This may well work with some groups, like adult male ducks, where most species can be easily distinguished using just the picture. However, many species you are likely to encounter will have a few (and even several) species which look quite similar, both in the field and in the guidebook. You should ensure that not only the picture but also the accompanying descriptive text match the bird you are seeing. Plumage may be the most useful identification trait but it is also the most variable. Plumages of adult birds change over the course of the year and almost all young birds have a different plumage from their parents until they reach reproductive maturity (which is from one to several years after hatching). Other identification traits you should be using include vocalizations, leg color, size and shape of the bill, eye rings (if any) and the bird’s behaviour. Most birdwatchers become proficient at identification by concentrating on male birds, as the males usually have brighter, showier plumage. And that’s OK; it’s a great way to learn about the different species. But eventually, you will also want to figure out what those other birds near the males are, those dull brownish or greyish birds. Often, those are the females and/or juvenile birds. As an adaptation to increase their chances of survival, female birds are often dull colored, which is a very effective camouflage color when sitting on a clutch of eggs. Having dull-colored juveniles helps to conceal them as well from the sharp eyes of predators. A good field guide will have three images for each species, one for each of the males, females and juveniles. Does the bird in front of you belong in your region? I was once convinced that I had a new bird record for our region when I sighted what my ‘been-birdwatching-for-three-whole-months-now‘ brain was certain was a Tricolored Blackbird. Turns out, had I bothered to look at the range map for that species I would have realized they don’t normally occur within a thousand miles of my house. The closely related, and very common, Red-winged Blackbird did occur in my region and once the bird turned a little so I got a better look at it, it was obviously a Red-Winged. But of course, I didn’t get that good look until I had already jumped the gun and told everyone within earshot about my new discovery. Thankfully, they were a patient group and only laughed a little at my overly enthusiastic efforts. Birds can be found outside of their normal range but you should not claim a rarity without first checking its range map. There are many good field guides which cover all of the birds of North America, so you can’t go wrong with one of these. There are also many guides which will only cover a specific region, whether that be the eastern or western half of the continent (there are many species found on one side of North America but not the other), a single state or province, a park, a city, etc. The best bet is to use the field guide that was produced for the region you are in. While size can be a useful trait to separate some species from others, it’s a precarious field mark to use for most birds. It can be difficult to acurately estimate sizes from a distance and the size difference between two similar species may too subtle to distinguish unless they are perched side by side, a situation which rarely occurs. However, once you become more proficient at birdwatching, size can become one of the tools in your bird identification toolbox. For instance, the Lesser Yellowlegs sandpiper really is smaller than the Greater Yellowlegs (10 inches vs 14 inches). From a distance, the 4 inch difference is difficult to use as a definitive identification trait, especially when subtle plumage colouration and barring on the tail feathers are a better diagnostic trait. But once you’ve seen several individuals of each of these species, you will gain a better appreciation of size as an identifying trait. You may think you have found a really rare bird, or a lifer, or even just a really cool bird. Or at least, it would be if it weren’t for that odd stripe along its lower cheek. Well it could be that this odd strip can be used to distinguish Bird A from Bird B, even though it would mean you just found another individual of a non-rare or non-cool species. But that’s OK; once you become an experienced birdwatcher, you will find (as many others have before you) that while finding rare birds is great fun, just seeing the birds is the real reason you’re out there.